Charming basically tells Emma the Author “manipulated us” and that because of him they were “put on the path to causing Maleficent to lose her child.” It all sounds very passive to me, like this is their way of not taking responsibility for their actions. I’m hoping that changes. Gold’s interactions with Regina make it clear why he’ll never get his happy ending. “The affection I have for you, well, there are limits.” He always will care only about himself – we saw this in his relationship with Belle too. Loved seeing Robin and family’s first reactions to NYC – I’m fairly sure many people have that same initial response. In that vain, yes NYC is loud and busy, but really Marian? Your husband was a thief but you don’t know not to put your bag down unattended in a strange place? I have a friend who gave up watching this show because she said it was too confusing as a casual watcher if you weren’t paying close attention. And watching this episode I would have to agree – jumping between four different locales – modern-day Storybrooke, NYC, Sherwood Forest and Oz – kind of made my head spin. Going back and watching the beginning of the episode again after knowing about Zelena, there are multiple moments in which it is obvious (now) that this Marian is not Robin’s Marian. I love being able to go back and watch an episode with a whole new set of eyes after a plot twist has been revealed. And speaking of Zelena, the whole retcon of the Marian story made me wonder if this was planned all along, if it was a result of the popularity of Rebecca Mader’s Zelena, or if some other factor was at play that caused a shift in where they took that plot line. Anyone else think it’s a shame that Michael Socha’s Will Scarlet has been so wasted this season? He was signed as a series regular and yet all we’ve seen of him is bits and pieces as he’s thrown into whatever scene it seems semi-practical to use him in. I would’ve love to have seen an actual relationship develop with Belle, or more of his friendship with Robin, something more than what we’ve gotten so far. So Robin’s trip to Oz prompted his ‘steal from the rich, give to the poor’ gimmick and his new moniker. Convenient, but okay, I’ll buy it. I don’t buy any of this line though – “When you steal for yourself, that makes you a thief. But when you steal for someone else, that makes you a hero.” – Uh, pretty sure that still makes you a thief. That’s some shoddy logic you’ve got going on there writers. Now that Zelena is back, I do look forward to more scenes between Rebecca Mader and Lana Parrilla. The two of them played so well off each other. Anyone notice the Hidden Mickey? A random knick knack in the shape of Mickey’s head appeared in a draw at the Wizard of Oak store. This is the first time I’ve noticed one, but I’m sure there have been others. Sounds like a project for a future Once re-watch! “If this is New York, I’d hate to see the old one.” – Marian (or shall I say Zelena), referencing her purse being stolen upon their arrival in the city. My money’s on the Dark One. 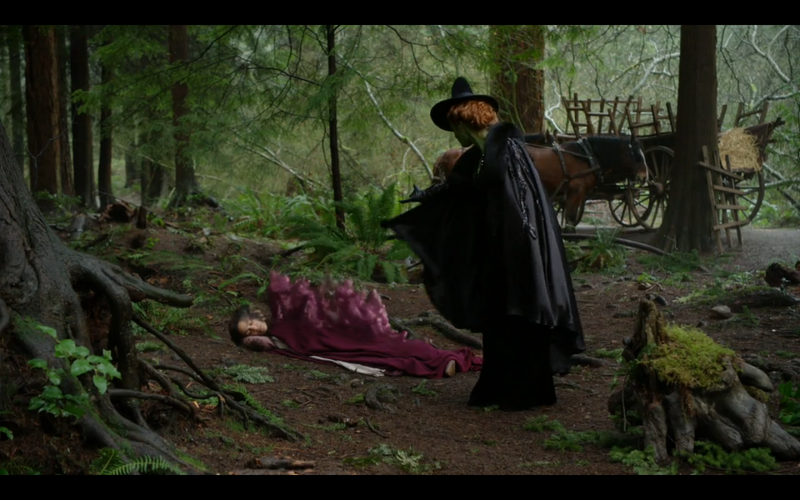 Or should I say, the Deathly Pale one.” – Zelena, while taunting an intubated Gold in the hospital. The episode ended with Gold revealing that Regina is vital in his plan to turn Emma to the dark side. And it would seem that she refuses. Or does she? That was a decidedly Evil Queen look on her face as we went to black. What did you all think? This entry was posted in Recap, TV and tagged Emma Swan, Michael Socha, NYC, Once Upon a Time, Oz, Rebecca Mader, Regina, Robin, Sherwood Forest, Storybrooke, Wicked Witch, Will Scarlet, Zelena. Bookmark the permalink.